I visited an area of town where they sell prosthetic limbs. 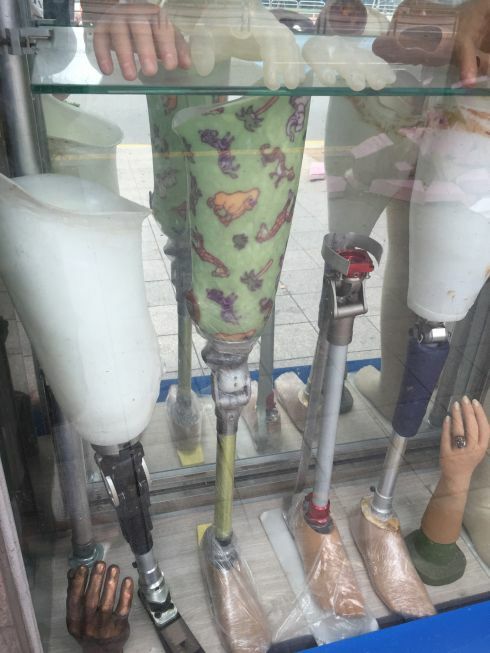 Store after store of prosthetic arms and legs. It’s fascinating, depressing, then fascinating all over again. It’s easy to imagine people who lost limbs and how sad it must be to come to such a place, but it’s also amazing that such people could also regain some of their freedom due to the amazing technology we have these days. We live in amazing times. We have prosthetic arms and legs on window displays! It also got me wondering at how people get into the prosthetic manufacturing business. Whatever choices in life could’ve led people to devoting their skills and talents to making arms and limbs. And how did it all begin? How do people go up and just decide, “you know what, there’s a lot of money to be made here. Let’s start a prosthetic limbs store!” In any case, however they got there, I’m jealous at what they do. At least they wake up in the morning knowing they’re making someone’s life be better. They’re helping people walk or regain the use of their arms again. Not many people can claim to change lives on a regular basis as much as these people. Unfortunately, to get there, I had to pass by a little hidden red light district. Afterwards, I had to go through an area frequented by homeless people. Under the certain conditions, my little stroll yesterday could’ve driven me to depression.